Flat Eric was a yellow puppet character seen in a series of commercials in the UK for Levi’s Jeans, advertising the “STA-PREST One Crease Denim Clothing” line. In the commercials, Flat Eric would ride with his friend Angel (played by Phillipe Petit) around California, evading the police as a wanted criminal. The character was based on a design by French artist Mr. Oizo (aka Quentin Dupieux). Mr. Oizo had created and built a character called Stephane. Stephane was almost identical to Flat Eric; the only differance was Stephane had ears and his hands were fixed. Stephane had appeared in some earlier short films by Mr. Oizo, and had a small cult following in the the UK and France. In 1999, Levi’s decided to build a television commercial campaign around the puppet, to be directed by Oizo. The character was renamed Eric, a more “international name,” in contrast to the original French name Stephane. The original concepts for the initial ad was to have Eric’s head get run over by a car giving him a flat head. That idea was later dropped, but the name Flat Eric stuck. When they first made him he looked too much like Kermit. He had a rounded body which Flat Eric isn’t supposed to have. It took 15 days to make him but the second puppet was too tall – he was like a small child and he wasn’t funny. Flat Eric has to be little and small to be laughable, so I said no to number two. The third or fourth time he was just about right. He had to be redesigned several times before he created the same mood and feeling that I had with my first, original puppet Stephane. The Levi’s ads took three days to shoot. The original short films made with Stephane cost around 15,000 francs to produce. The two Levi’s ads cost around two or three million each. 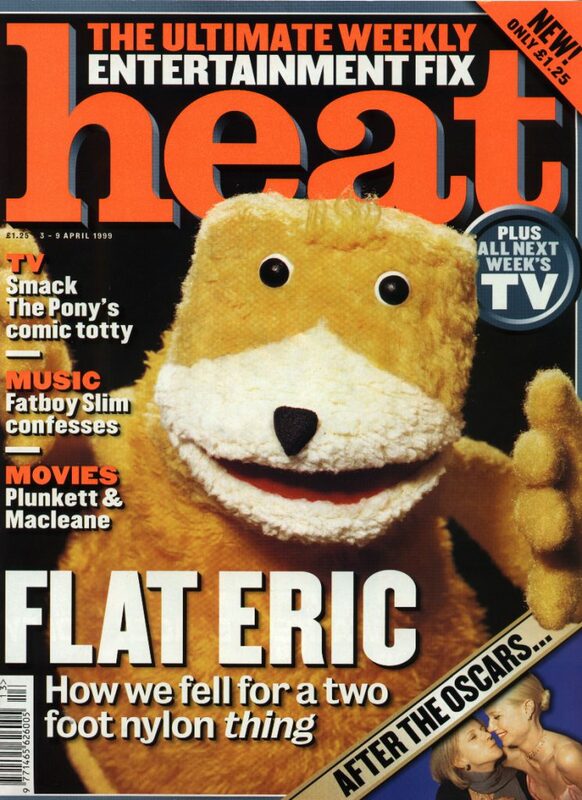 Flat Eric was also featured in Mr. Oizo’s music video for “Flat Beat”, and appeared as a prop in first season of the 2001-2003 original BBC comedy ‘The Office‘. The rights to the character are retained by Oizo. Videos , trailer clips and images are free for download here.